Weber Braai Bible is an all-in-one masterclass on every aspect of outdoor cooking. Whether you cook with gas or charcoal, this comprehensive guide contains everything an avid kettle braai enthusiast needs to know. Learn how to grill the perfect steak or ribs, butterfly a leg of lamb, cook chicken wings and legs without burning them, and smoke a turkey. Tips and techniques lift the lid on the secrets of successful braaiing, while chapters on marinades, rubs and sauces tempt you to find your signature flavours. From kebabs, chops and burgers to elaborate rotisseries, braaied vegetables, pizza on the grill, and banana s’mores, this book is packed with delicious recipes for all-year-round braaiing. 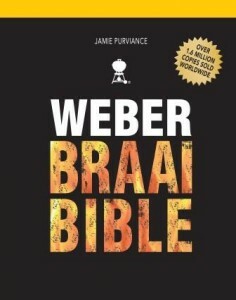 If braaiing is part of your lifestyle, and you want to take your outdoor cooking to the next level, you don’t need to look further than Weber Braai Bible. Buy your copy of Weber Braai Bible from any Bargain Books store nationwide and you could win one of four Weber Compact Kettle Braais valued at R1900 each! Details in store. Click here to find your closest Bargain Books store.